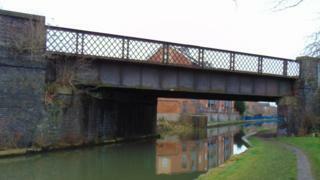 A bid to repair a Victorian canal bridge and unify two branches of a historic railway has attracted more than £250,000 in donations. Great Central Railway (GCR) launched an appeal to raise funds to fix a bridge in Loughborough, which would allow both halves of the lines to be unified in an 18-mile (28.97km) track. Work to reconnect the two halves of line began in 2016. Managing director Michael Gough said he hoped work would begin this winter. "The reunification project is a long-term aim, but we believe when complete it will be a benefit to the East Midlands economy and a significant national attraction," he said. "The canal bridge is the next part of the jigsaw." The Great Central Railway runs from Leicester to Loughborough, while the Great Central Railway Nottingham runs from south Nottinghamshire to north-west Leicestershire. The once-unified route was left with a 500m gap after infrastructure, including bridges, were removed in the 1980s. After the bridge is repaired, further funds will need to be raised for design work and preparing a planning application for the rest of the reunification project. About 100,000 people visit the railway - the only place in the world where full size steam engines can be seen passing each other - each year.